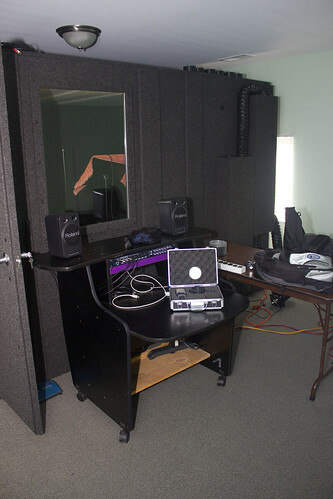 We promised it to you a while back and we apologize for the delay, but good things come to those who wait and so here it is – the long-awaited saga of the delivery and construction of the ARTC Studio recording booth! If you want to see all the pictures, check out our Flickr page! To begin, we’d like to thank our longtime recording home Audio Craft for many years of stellar work. We’re not done with Audio Craft by a long shot, but the demand for our studio work had grown so great that we really needed a space of our very own. Here we see the bare room that we’ll be constructing in. There was some brief concern that we’d measured incorrectly and that the booth wasn’t going to fit in here, but as it turned out all was well. Notice the stained glass lamp in the corner that one of our multi-talented members made! The first step was getting it off the truck. 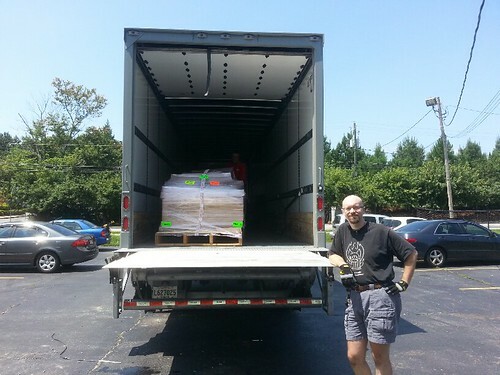 ARTC Executive Producer David Benedict poses here with the pallets still on the truck. 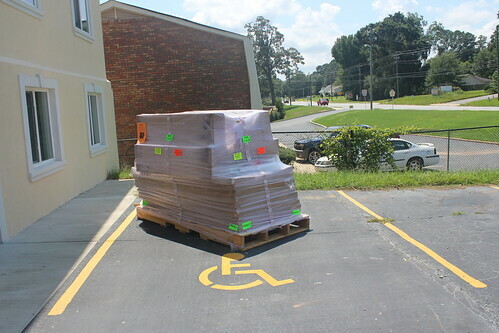 You can’t really see it here, but the pallets were eight feet long and the truck driver had thought we had a forklift. We’re not sure how they arrived at that conclusion, but at least they brought a truck with a lift gate! David and ARTC Board member Tony Fuller help the truck driver with the load. Discerning viewers will note a problem with the length of the pallet vs the width and depth of the lift gate. We did it! And then we had to do it again, because there were two of these pallets. And then we had to carry all the individual boxes upstairs. And, as you can see, there were a LOT of boxes. Don’t worry, folks, all that cardboard got recycled and didn’t find its way to the landfill! Construction took multiple days for a variety of reasons, most of which involved user error. Here we see David Benedict, Daniel Kiernan, and Bob Brown positioning the floor panels. With the floor down, the next step was to position the walls. Here, Clair Kiernan and Bob Brown assess the situation and determine next steps. The first major snag of the day. This, ultimately, was what caused us to take multiple days for construction. 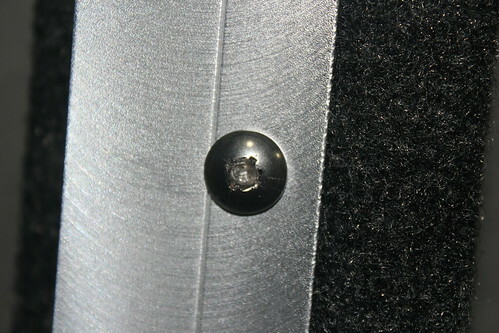 The instructions said to mount the door frame first, but the screw was stripped when we took delivery. While someone went to get a tool to let us remove it and get a replacement, the rest of us decided to go ahead and put up the other walls. This was a huge mistake, because it turns out that the reason you’re supposed to mount the door frame first is because it has a metal bracket that forces it into the proper alignment. The other walls don’t, and therefore the entire structure was skewed when we put up the last pieces. It took us time to figure that out, and then more time to loosen all the screws, shift things where they should have been in the first place, and then tighten it all back down again. Here you can see Tony Fuller and David Benedict putting what they thought were some of the finishing touches on the recording booth. Little did they know that there would be at least three more visits to the studio space before everything would be where it really belonged. But eventually it all came together! You can see some of the ventilation on the right hand side. The microphones we bought for the studio are super-sensitive, but the ventilation silencing systems on these booths is actually extremely good and you can barely tell the difference! And of course it’s still a work in progress. Here’s a preliminary setup, but we’ve got ideas for how to make ARTC Studio even better and we’re looking forward to ramping up production before this month is out! We’ll be concentrating on finishing up some existing projects, but new recordings are coming, too, so stay tuned!